Welcome back everyone. To say we’ve had a lot happen since you last joined us (assuming you haven’t been back since Arie’s season ended) would be quite the understatement. We had every date this season except about 3 spoiled in real time, including the final rose ceremony, which was spoiled by a tabloid (TMZ) before the season started for the first time ever. More on that later. But just wanna start out by saying what a fun weekend it was in Denver. I mean, can you beat first row seats to Taylor Swift? That answer would be no. Then Saturday night at the Rockies game was kind of a sh** show, but tons of fun. I have Lace Morris and Leah Block to thank for showing me around. From meeting the strange Lithuanian dude at Viewhouse before the game (which you can watch on my IG), to maybe watching a ½ inning of the actual game, then post-game hitting up at least 3 different bars that I can’t remember the names of (Meadowlark I think was one), to then wandering the streets of downtown craving pizza at 1am, finding giants slices at Marquis (my new favorite pizza), having someone in the party ditch me so I gave the remaining slices to a homeless guy, then taking a pedal cab home because I was tired of walking. All in all a great trip and looking forward to the next stop on the summer tour in San Francisco June 21st-24th. I’ll update more as we get closer. Get your “Reader Emails” and “Dr. Reality Steve” emails in tonight and tomorrow to be posted this week. Also, this Thursday will be the last “He Said, She Said” podcast on Stitcher Premium with Sharleen Joynt. It’s been a great year run and I had a blast with Sharleen. Scheduling and some things for her are preventing us from continuing. However, I will have some news on that front that I will announce on Thursday’s podcast, so stay tuned. We have A LOT to get to before the recap of last night’s episode, which starts on page 3. The Fan Appreciation Party is next Friday night at Mandalay Bay in Vegas. We are overbooked so not accepting any more people, I’m sorry. Last year’s party had 70 people, which was the most we’ve ever had. Right now, I’m at 100 for this year now. It’s why I started to promote this in February. Want to give people plenty of time to book flight/hotels, etc. However you at home will be able to participate somewhat as we’ll be Periscoping the Trivia Contest like we do every year. Usually starts about 9:15-9:30pm PST, so east coasters, sorry for the late start but it is what it is. If you wanna check it out, you’ll be able to. As always, I’ll have the test, the answers, and the winners announced in the following Tuesday’s column. Looking forward to seeing everyone there who has responded. Lets first start off with the schedule for the season. NBA Finals Game 5 is scheduled for Monday, June 11th. So there will not be a new episode of the “Bachelorette” that week, which means they’ll either double up at some point this season with a back-to-back Sunday/Monday or Monday/Tuesday episodes. OR, at the end of the season, run the “Men Tell All” on a Sunday night and not give that episode its own week. That’s the only way the season ends on time for the Monday, August 6th finale. 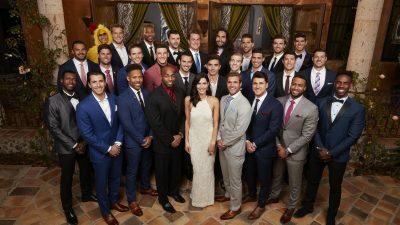 That officially hasn’t been announced, but if you look at their past “Bachelorette” seasons, it’s always ended on the first Monday in August or last Monday in July. There’s 11 episodes every season, and if you do the math of the next 11 Monday’s, it puts the finale on August 6th. I think even if the NBA Finals end in a sweep (highly unlikely), I doubt the June 11th episode would still be a new one anyway. I’ll keep you updated once ABC makes their plans official and sends out a press release. Which basically gives us no clarity at all. We don’t know what the writer did other than “cross the line,” which could have a 100 different meanings. The biggest thing I took from the piece is that, yet again, Arie feels like we should somehow think he’s the victim in all of this. Saying the producers told you to sit there and wait for Becca and not leave, and telling you to go back inside, then saying you felt betrayed – sorry. Falls on deaf ears. You mean the same producers that didn’t give a sh** about you four years ago when they told you you were the “Bachelor,” filmed your intro package, then pulled the rug out from under you to go with Chris Soules? If you don’t know by now, you’ll never know. I can’t believe he’s still playing that card. And enough already with the, “Well, I did it on camera because I knew that’d make her the ‘Bachelorette’ so isn’t that what everyone wanted? Look at me, I’m the hero!” Worst. Take. Ever. He just doesn’t get it and never will. So many other things wrong with things Arie said in that story, but those were the biggest sticking points to me. Moving on. -Those pictures taken in the Maldives where she’s clearly kissing Garrett with crew all around snapping and taking pictures, was AFTER she’d already gotten engaged to Blake. -Blake was told to stand aside and let Becca do basically a fake photo shoot with the guy she just dumped, kissing him and taking pictures with the crew. -Blake would have to think that’s a cool idea to go along with (as would she and Garrett). -Then AFTER those pics we see from TMZ were taken, Garrett is whisked away, Blake is brought back in and she’s happily with Blake. If you truly, honestly believe that’s what those pictures represent, I don’t know what to tell you. The pictures are legit, she’s engaged to Garrett, and that’s the end of the story. There is no need to try and prove it otherwise. I know every season when I give my finale spoiler out, of course people will doubt it because I rarely have ever had any proof. You just have to trust my track record. But now for the first time in 36 seasons, paparazzi got pics and released them of the final rose ceremony before the show even started, and yet there are STILL some that refuse to believe it. Goes to show that nothing in the history of the world will ever convince everyone of the final rose ceremony spoiler. We actually finally have pictures of it happening, it’s clear as day who it is and what they’re doing, and there are still doubters. Pretty funny. And insane. TMZ may have posted the pictures before I was able to spoil who Becca’s final choice is, and trust me I’ve heard enough chirping about that, but yesterday was the biggest traffic day in the history of my site – by almost 300,000 page views it beat the previous heaviest traffic day. So it’s all good on this end. If anything, TMZ’s pics probably helped. One thing I can report is that I’m hearing Leo and Kendall (who both live in LA), are already talking and have been out together. So expect those two to immediately bond in Paradise. I’m sure there will be more, but those are ones I’m pretty solid on. I know a lot of you will have, “What about this person” or “What about that person” questions. I get it. I’m just telling you what I know as of right now. If you didn’t see a name there, it doesn’t mean they won’t be on. In addition, we are most certainly going to have international contestants on Paradise this season. Probably some repeats from Winter Games and/or pulled from other franchises. Yuki I’m hearing is definitely gonna be on, but I don’t know in what capacity. I get this feeling they’d make her the bartender or something because it’s kinda hard to go on a date with someone that doesn’t speak the language very well at all. And of course, they always pull some rando’s from previous seasons where you’re like, “Who?” Expect a couple of those mixed in as well. Of course there will be others because I only gave you names from the two most recent seasons since that will make up most of the cast. As I tweeted out yesterday, I will be giving your episode-by-episode spoilers on Thursday. However, based on everything tweeted and posted in this column since filming began back on March 15th and ended on May 10th, every single date this season has either been spoiled by me or by pictures from social media already. The only 2 you don’t have were the 1-on-1 in episode 3 (Chris Randone), and the other 1-on-1 in Park City that wasn’t Garrett (Wills Reid). In addition, you know about the episode 3 drama where Becca’s friends, including Tia, join her to give the guys mani’s and pedi’s on the group date. This is where Tia and Colton’s past comes up, but Becca obviously keeps him around until final 4. What you didn’t know until I tweeted yesterday, was that Tia actually comes back to talk to Becca before the final 4 rose ceremony to tell Becca she still has feelings for Colton. Colton is eliminated at that rose ceremony, so make of it what you want. And both Tia and Colton will be in Paradise, so this story will be continued, for sure. What happens is anyone’s guess, because I don’t know if Colton is all too thrilled with what happened based on what I’m hearing. I can’t see how Tia thinks that’d be a good look for her, but hey, I don’t get a lot of things these people do sometimes. He’s only being judged because it appears that he is a conservative. In today’s world especially anything or anybody that is connected with Hollywood, you’re automatically looked down on and bullied for having conservative beliefs. They call everybody that have conservative views racist, judgmental, and intolerant. When they are being everything they claim to hate. Liberals say they are open minded but how open minded are you when you judge somebody for their political views. They proclaim to hate bullying but yet they think they can bullying someone into having the same mindset as theirs. It’s getting to the point we no longer even have freedom of speech. Leave the man alone and quit judging and thinking you know him by his Instagram likes, especially since we don’t even have his side of the story. It’s a shame that someone is always offended by whatever you say or do. I’m sure there’s a whole lot more to him as a person. Left or right or middle – we all know wrong and creating, laughing at, liking and / or supporting a photo of a child being thrown over a wall is wrong. All decent human beings know this. Do not let politics cloud that over. And bravo to Ashley Spivey for bringing it to our attention. “The only thing necessary for the triumph of evil is for good people to do nothing” – Edmund Burke. And I remind or inform you that the rise of Nazism came from cartoons about Jews. Lastly, feminism is the advocacy of women’s rights on the basis of the equality of the sexes. There is nothing “nazi” about it.